Never in a million years did I think that my regular vocabulary would include things like breast cancer, reconstruction, expanders, and that I would have to “shop” for the right size and shape breasts to replace my own. But here I am six weeks post implant exchange surgery. 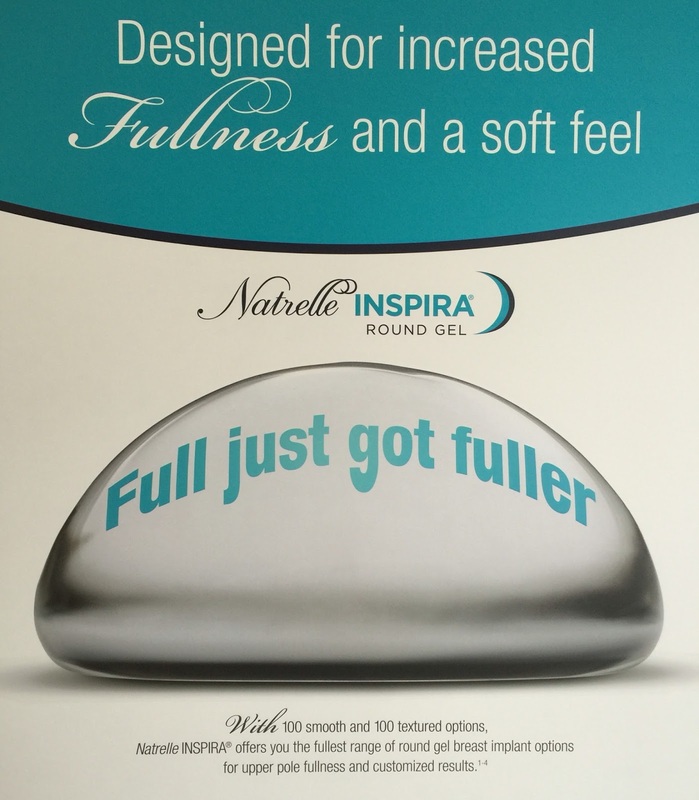 After waiting 5 months for my body to fully recover and strengthen from my bilateral mastectomy with immediate latissimus dorsi flap reconstruction, I had my expanders swapped out on October 2, 2017 for 210cc Natrelle Inspira smooth round gel implants. I was nervous going in for yet another surgery (my third in just over a year) but also felt anxious and excited to get these rock hard expanders out and move on with my life. Since I would be returning home the same day, I didn’t pack any personal belongings with me to the hospital other than the clothes I was wearing, my cell phone and a list of my current medications. Once I was checked in, the nurse went through my medical history and then it was time to gown up and wait. Surgeries were running behind that day so I anxiously waited until my name was called an hour later to go back into the surgical area. The anesthesiologist spoke with me first and explained what she was going to do which helped calm my nerves and set up the IV line to get things started. My plastic surgeon then came in to draw out where he would be making the incisions to do the exchange. 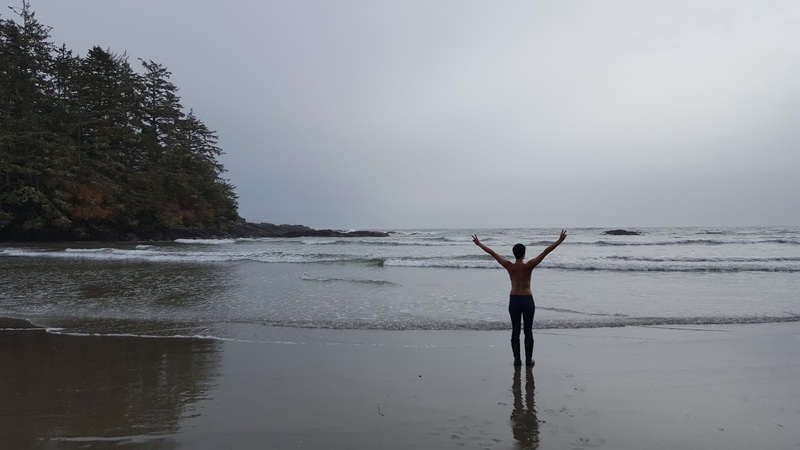 In order to minimize scarring, he would cut into the existing scar line from where the latissimus dorsi flap had been placed rather than going in from the underside of my breasts. 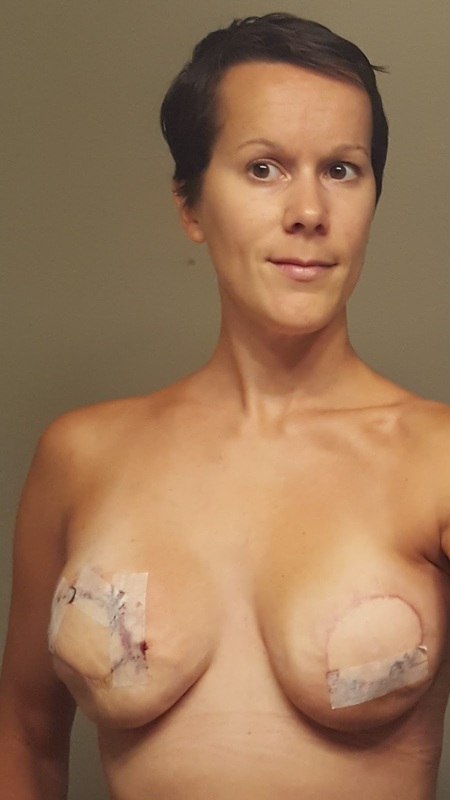 Normally, a 2-3 inch incision would be made just big enough to remove the expander and swap for the implant; however, my left breast still had a couple inches of loose skin that needed to be removed which would require a bigger incision. I walked down to the operating room afterwards where I was met again with the anesthesiologist, plastic surgeon, and nurses that would be working on me. Within moments of laying down on the operating table, I was put off into dreamland until I awoke almost an hour and a half later in the post anesthesia care unit (PACU). As the anesthetic began to wear off, I noticed the scratchiness in my throat from the breathing tube and slight pain in my left breast. My chest had been wrapped in a tensor bandage and I had an intermittent pneumatic compression (IPC) device pulsating on my legs to prevent any blood clots. I was still quite groggy from the anesthetic so I let myself drift in and out of sleep until I was ready to wake a few minutes later. Once I was able to sit up on my own and move around, the IPC was removed and I was wheeled off to the recovery room. The nurse checked my bandages and pain levels and asked me shortly afterwards if I felt ready to go home. I was still a bit groggy but otherwise in good enough shape to make my move and bust out of the hospital. As soon as I got up though to put on my clothes, a wave of nausea came over me and I had to lay back down. Thankfully I still had the IV port in so the nurse administered some anti nausea medication which made me feel better almost immediately…and with it, very tired as well. I dozed off again and probably could’ve slept there all night but I wanted nothing more than to get back into the comfort of my own home and was finally released three hours post surgery. Before leaving the hospital, I was given a prescription for some pain medication as well as five days worth of antibiotics. Because my immune system was still somewhat compromised since chemotherapy treatments and the history I’ve had in the past with infections, the antibiotics were given to me as a preventative measure just in case. On the drive home, I used a seatbelt pillow that was given to me from the hospital post mastectomy to help pad the area around my breasts as it felt tender from the bruising especially on my left side. When I got home, I laid down on the couch until my husband awoke me for dinner. I hadn’t eaten since 10pm the night before and was starving! My left breast was still in pain from being cut more so I took one of the prescribed pain meds and went to bed for the night. When I woke up the next day, I still had a bit of pain in my left breast so I decided to take another pain med to help take the edge off. I’ve had issues in the past with pain medication making me ill but I figured since I didn’t have any issues the night before that it would be fine. Ugh was I ever wrong. I ended up feeling sick for hours until the medication finally worked its way out of my system. As I started to feel better, I noticed the bandages across my chest were beginning to unravel and soak through. The nurses had given me instructions prior to the leaving the hospital to wear a compression or sports bra once the bandages were ready to come off so I had my sister drive me down to the local pharmacy where I found this soft comfortable front closure compression bra by Ameona. 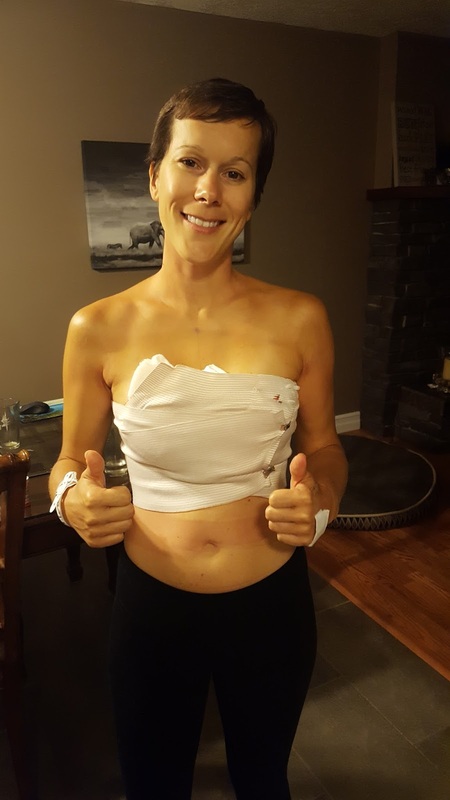 Even though I could have removed the bandages that day, I just didn’t feel emotionally ready yet and decided to wear the compression bra over top until the next day. 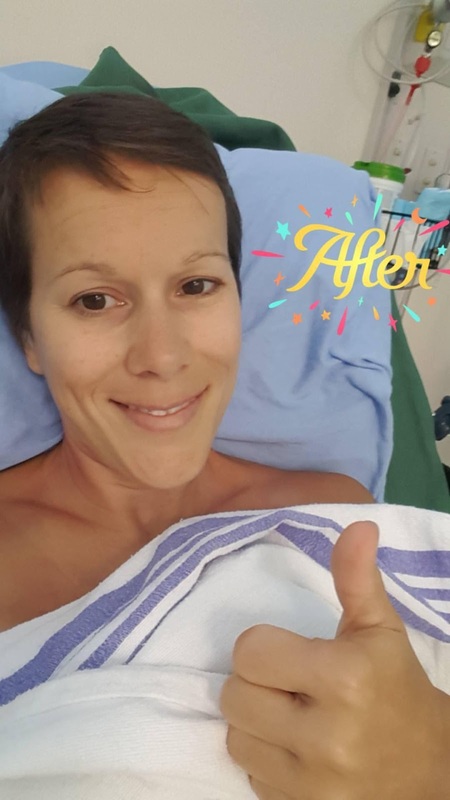 I found myself in front of the mirror the next morning feeling anxious just as I did when I removed the bandages from my lumpectomy the year before and then again after my mastectomy in June. 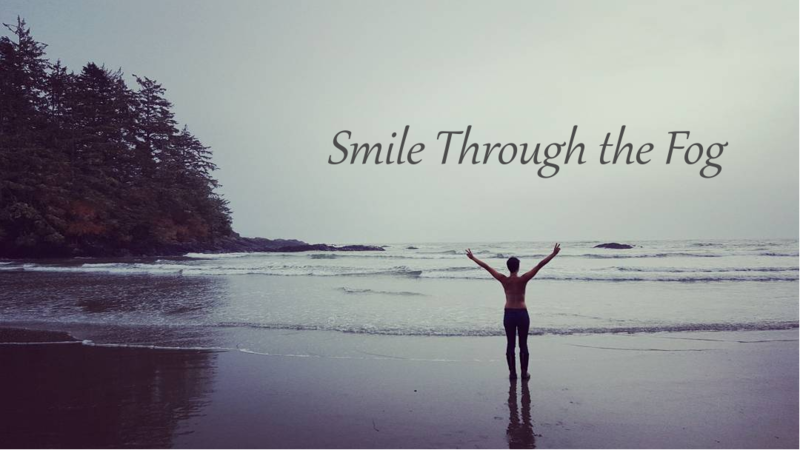 It’s hard to have part of your body amputated and hope that you can feel a sense of normalcy and happiness with your body again. After a few deep breaths though, I took off the bandages and felt a mixture of emotions. I was overall happy with the way my breasts looked but also disappointed as I began noticing the little imperfections. Roughly half of the scar on my left breast had been cut into to swap out the implants whereas the right had an incision about 2-3 inches long but there was still a bit of loose skin remaining on the lower part of my left breast and some denting/rippling in spots. Although breast reconstruction has come a long way over the years, it is still very difficult to restore breasts to their natural shape and size again. All of the breast tissue has been removed leaving only an implant and, in some cases like mine, donated tissue to work with to reconstruct new breasts. 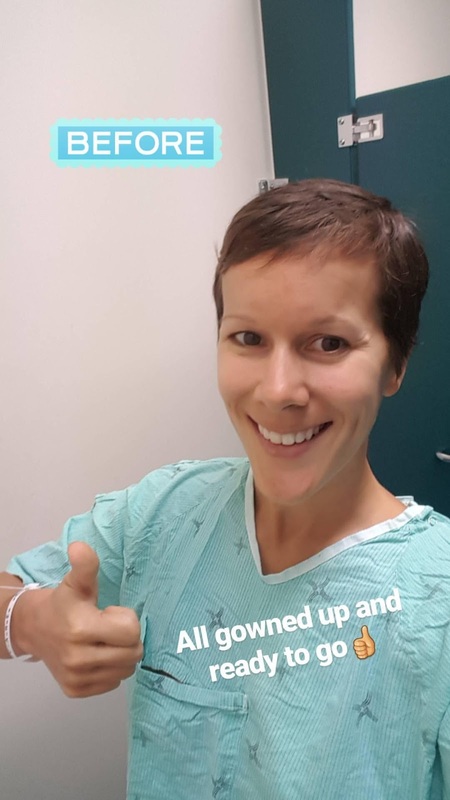 Throughout the week following surgery, I had been experiencing some low-lying nausea which my doctor attributed to the antibiotics but the pain and bruising was beginning to subside in my breasts. My plastic surgeon had advised prior to surgery that the recovery time would be about 2 weeks but I was still able to get out walking and move around, just no heavy lifting or running. I still had to be careful with sleeping as the incisions needed time to heal but the pain and discomfort from the expanders was noticeably gone. I wore my new compression bra day and night but cheated and snuck on a bralette a couple times to see how they looked. The implants already felt so much squishier and looked much more full and natural than the expanders. Plus, the recovery from this seemed like such a breeze compared to my last surgery. At my follow-up appointment two weeks later, the plastic surgeon removed the remaining steri strips on my breasts and cleaned the incision areas which were healing up nicely. Although I was hoping that this would be the last surgery, I knew there was the possibility for some minor surgeries later on to touch up any imperfections. I voiced my concern about the excess skin and denting but he advised that it could take months for the swelling to fully go down and for the implants to settle into place. Because of this, he didn’t want to even consider doing any touch ups for at least a couple more months until things had settled more into place. Patience is not my strong suit but I trust my surgeon and knew it was best to wait. In the meantime, I needed to take it easy for another 4-6 weeks which meant no running, no high impact exercises or basically anything that would jar my breasts. Before I left the surgeon’s office, the receptionist handed me some paperwork which she explained was my registration and warranty for the implants. I had a little chuckle at first at the fact a part of my body was now warrantied and registered. But in all seriousness, implants are now registered for the safety and well being of patients in the event that there is a recall on faulty breast implants which, although very very rare, can happen. This whole thing is a learning process and something that I would have never imagined having to ever worry or think about but it is just part of my life now. It’s now been six weeks since my surgery and am slowly trying to adjust back into a normal routine. I’ve just recently begun some gentle yoga and light weights and have noticed the implants settling more into place. The denting on the bottom of my left breast has softened up although there is still a fold of loose skin which I will likely discuss with my plastic surgeon about removing at my next appointment on December 28th. My body is not perfect and I am reminded of what I have endured every time I look in the mirror and see my scars looking back at me. But I am learning to practice self love and embrace this new body of mine and all of its imperfections. Expanders, foobies, frankenboobs, rocks, boulders…what do you call them?